Home » Anti-Money Laundering » 2016 SAR Insights: Suitcases of Cash No Longer the Front-Runner in Public Corruption. 2016 SAR Insights: Suitcases of Cash No Longer the Front-Runner in Public Corruption. Dynamic Securities Analytics, Inc (“DSA”) analyzed 2016 SAR filings reported in FinCEN’s SAR Stats database. DSA will be posting a series of articles on the analysis with today’s post covering financial instruments used in suspicious activity. The bubble chart below shows the relationships between Suspicious Activity Types, Products, Instrument (ie. payment mechanism) and Industry. For instance, if you wanted to learn more about Elder Financial Exploitation which DSA identified as the suspicious activity with the largest percentage increase in 2016 SAR filings, you can filter by Suspicious Activity Type. When you hover over the top orange bubble, you’ll learn that in 2016 Depository Institutions reported 1,865 instances of Elder Financial Exploitation using the Instrument of US Currency with a Product of Debit Cards. DSA also determined which Suspicious Activity Type had the highest percentage of use for each Instrument. For example, Travel Checks were rarely used in any Suspicious Activity however they had the highest percentage of use in Suspicious Use of Informal Value Transfer System (ie. hawala). Alternatively, Bank/Cashier’s Checks were most often associated with Appraisal Fraud. Funds Transfers, US Currency and Personal/Business Checks were the most often used instruments for a variety of Suspicious Activity. The columns list all of the Suspicious Activities where that Instrument was the leading payment mechanism. 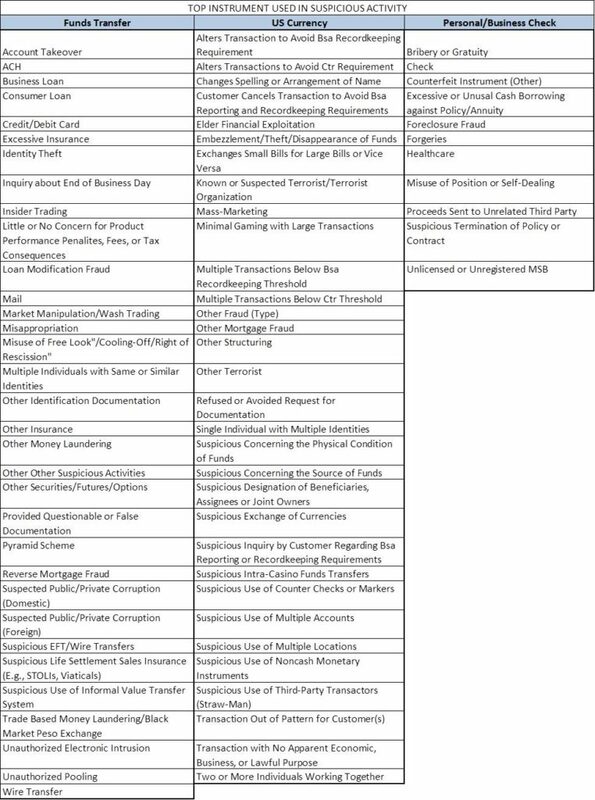 While some leading Instrument relationships seems straightforward, like Personal/Business Checks being the top Instrument for Check Fraud, other top products were not so obvious. For instance, Mass Marketing most often used US Currency, Healthcare Fraud most often used Personal/Business Checks and Public Corruption used Funds Transfers, not suitcases full of cash. * 2016 SAR data covers the period of January through October 2016. Raw data from FinCEN SAR Stats. A SAR can include multiple suspicious activity types, products, and instruments. ← 2016 Suspicious Activity Reports: Most Industries Increase Filings, Securities the Exception. Elder Abuse has Largest Increase in SARs.